Saw a nice pasta dish over at “Better When Broken,” that I just had to try, and of course would have to modify. The modification you ask? 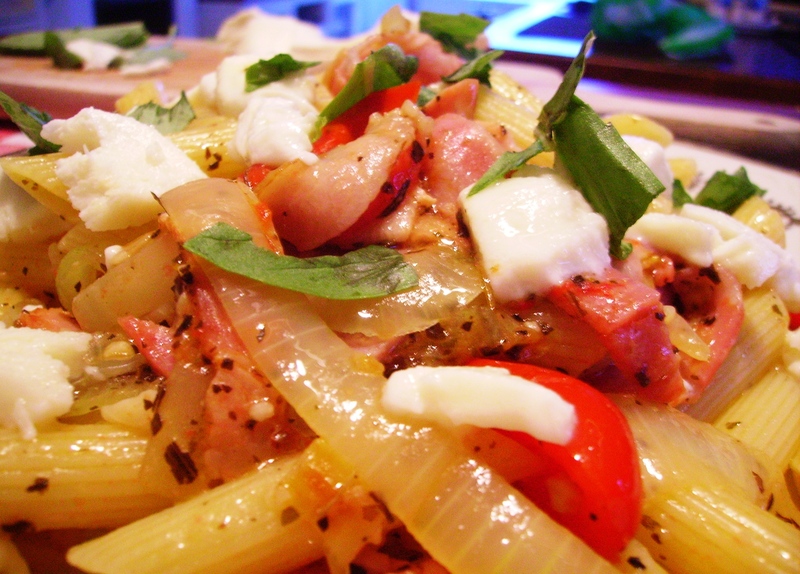 Well by taking the traditional Caprese salad ingredients of this dish and adding some bacon and onion. In a pot of water add a tbl of your olive oil and bring to a boil. In a saute pan add a 1/4 cup of olive oil and heat on medium heat. Add your onions, tomatoes, chopped garlic, and minced basil to the oil and cook uncovered. As the pan begins to dry out add your chicken stock and bacon. Cook until onions are translucent and bacon is cooked. When pasta is done strain and pour mixture of your saute pan over the pasta and toss. Add your fresh basil and fresh buffalo mozzarella on top of the pasta and serve. This entry was posted in Bacon, Basil, Buffalo Mozzarella, Cherry Tomatoes, Chicken Stock, Cooking, Cuisine, Dinner, Eating, Ementhaler Cheese, English Bacon, Extra Virgin Olive Oil, Food, Garlic, Herbs & Spices, Italian, Italian Cuisine, Italy, Meat, Olive Oil, Onions, Pasta, Penne, Recipes, Vegetables. Bookmark the permalink. Those additions to an already wonderful dish can only make it more wonderfuller! Love the combo of bacon, baby tomatoes and onions – did you use one onion? Mandy I cannot believe I forgot an ingredients :O Thanks and it was one. Nice! – looks like these additions will the carnivores out there happy! Oh there’s just something about sauteed onions. Simple pleasures. Great recipe.